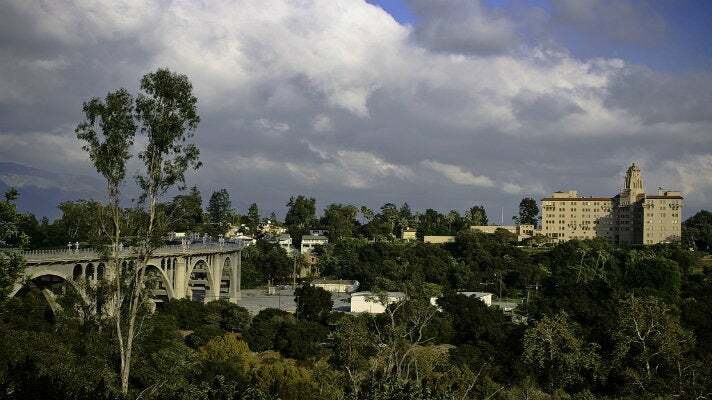 With the classic California style of Pasadena at its heart, the San Gabriel Valley overflows with fine dining, beautiful rose gardens, lovingly restored Mission Revival and craftsman homes and world-class museums. Pasadena is where palms reach for the skies, offering a breezy grace that only the West Coast can pull off. In addition to its peaceful gardens, the city is also filled with intricate arches and ornate duomos which appear throughout distinctive neighborhoods steeped in culture. Step into the serenity of a lavish vineyard or brave the crowds at the annual Tournament of Roses Parade on New Year’s Day or the annual college football match up at the Rose Bowl Game. Pasadena’s charming small town feel invites you to stroll the streets in search of a unique boutique or a relaxed coffeehouse. Pasadena is home to a wide array of shopping options, from upscale and chic to name-brand bargains. Old Pasadena, Paseo Colorado and South Lake Avenue shopping areas combine to offer a wide array of shopping destinations from the Apple Store to Tiffany’s. Also nearby on Colorado Boulevard is Vroman’s, one of the oldest (and best-stocked) independent bookstores in the state. For a really unique experience, stop by San Gabriel Square in nearby San Gabriel. This giant Asian mega-mall will convince you for a moment that you’ve left the continent. With its 12-acre, 220,000 square-foot sprawl, pretend you flew across the world to pick those shoes you’ve been eyeing. ARTS buses shuttle visitors to the main areas: Old Pasadena, Paseo Colorado, the Playhouse District and South Lake Avenue. The vibrant cuisine scene in the San Gabriel Valley is one of Southern California’s best-kept secrets. New and exciting bistros open up shop seemingly every week, and old standbys continue to pack in foodies of all stripes. Asian cuisine is popular here, and in nearby Monterey Park, the New Chinatown offers what some claim is the best Chinese food in the country. Also check out Benihana in the City of Industry, where a revolving river with tiny sushi-laden boats delivers your dinner right into your hands! Pasadena offers a diverse array of eating options, including deliciously spicy fare at Akbar Cuisine of India or All India Café , family-style Italian at Buca di Beppo and fresh seafood at McCormick & Schmick's. And because the weather here is mild year-round, many cafes and restaurants offer indoor-outdoor seating, including Twin Palms, a local favorite for alfresco dining, which is slated to reopen in summer 2013. Soak in all your favorite Impressionist pieces, ranging from Renoir to Degas at the Norton Simon Museum of Art. Explore the bi-level gallery, where European and American art resides upstairs and South and Southeast Asian treasures are displayed downstairs. Among the masterpieces here are no fewer than 45 works by Picasso. More cultural delights can be found at Huntington Library, Art Collections, and Botanical Gardens, which recently received a $10 million renovation. Well known as the home of Thomas Gainsborough’s iconic The Blue Boy, the Huntington houses one of the most impressive portrait galleries in the world. Also at the Huntington is one of the San Gabriel Valley’s most exciting new attractions, the Garden of Flowing Fragrance, commonly known as the Chinese Garden. Inspired by ancient Chinese traditions, the garden highlights the already scenic landscapes of the Huntington’s surrounding area with man-made ponds, pagodas, lotus and plum flowers, as well as traditional Chinese architecture. For a different cultural tradition, visit the San Gabriel Mission. Spaniards founded the mission in 1771, shortly before the City of Los Angeles was founded nearby. Today, visitors can take guided tours of the mission building and grounds. A number of amazing homes are also on display here. Tour the Gamble House, a stunning piece of architecture that defines the arts and crafts movement. Oakland, Arden and Oak Knoll Avenues are lined with opulent mansions — driving down them will have you “oohing” and “aahing” at every block. Horticultural treats are in store at Descanso Gardens in La Canada Flintridge, with the largest collection of camellias in North America and the recently renovated Boddy house. Meanwhile, the 127-acre Los Angeles County Arboretum & Botanic Garden features several gardens grouped geographically and the cottage made famous by the TV series Fantasy Island. Need a little exercise? The Arroyo Seco, in the hills surrounding the Rose Bowl, is filled with lovely trails. And if you enjoy watching live horse racing, Santa Anita Park, "the great race place," is the venue of choice, open annually from December 26 through late April and from early October to early November. The excitement may start with the gun, but it doesn't stop there — great food, contests and family fun days make it a good time for everyone. West Foothill Boulevard contains several motor courts — originally hotels designed for road trip travelers — such as Harding Court. Built in 1921, Harding Court boasts 15 completely restored bungalows now labeled as historic landmarks. On the corner of Foothill and Magnolia you will encounter the Aztec Motel, one of the most unique vintage gems on historic Route 66. Stained glass and brass railings embellish the Native American-themed lobby of this restored 1925 hotel. Having undergone a multimillion-dollar renovation, the cozy, boutique-style Hilton Pasadena stands as one of the city’s premier hotels, along with the opulent Langham Huntington Hotel & Spa, Pasadena. The hotel is a landmark in Pasadena, known for its sweeping grounds and luxurious stylings.